It’s often said that Americans consume too much bad fat and not enough good fat. So, how can you tell which is which? Saturated fatty acids are found mainly in animal sources such as meat, poultry and butter. Trans fatty acids are found in vegetable shortening, some margarine, snack foods, cookies and other foods made with hydrogenated or partially hydrogenated oils. Omega-3s are naturally found throughout the body and are most abundant in the brain. Today, more and more food products claim to be a good source of omega-3s, but not all omega-3s are created equal. There are three major omega-3 fatty acids each with distinct health benefits: DHA, which is most abundant in the brain; EPA, which is important for heart health; and ALA, which serves the body as a source of energy. 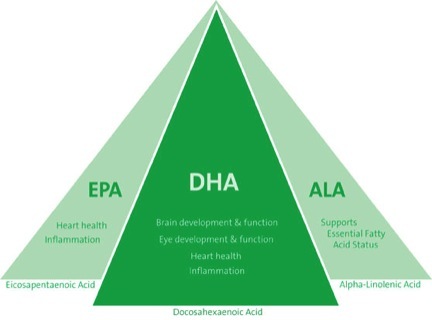 DHA is along chain omega-3 fatty acid and is the most abundant omega-3 in the brain. Just as calcium is essential for building strong bones, DHA ensures that the cells in the brain develop and function properly through all stages of life. DHA is found in fatty fish. There are also more than 550 supplements, foods and beverages fortified with a vegetarian and sustainable source of DHA from algae.